Tong Dawei, Huang Xiaoming and Deng Chao seek American Dreams in China. The Skinny: An entertaining but problematic comedy-drama from director Peter Chan about three dream-chasing Chinese entrepreneurs. Good performances and well-drawn relationships help to compensate for an unconvincing and underdeveloped third act. Some content may be a real turn-off to Western audiences. by Kozo: After successful detours into genre fare, Peter Chan returns to the themes of love and friendship that made him one of Hong Kong’s most successful commercial filmmakers. Except now he’s doing it in China. American Dreams in China features China actors, a China setting and China themes so it may prove less fulfilling to fans of the Hong Kong-centric Comrades, Almost a Love Story, arguably Chan’s greatest work and the film most similar to American Dreams. Both films view history through a nostalgic lens, both feature young Chinese pursuing their dreams, and both use love and friendship as measurements for character growth. The major difference besides the China setting and characters: Comrades dealt with a love between a man and a woman while American Dreams is mostly about the friendship between three men. Also, Comrades, Almost a Love Story is way better than American Dreams in China. We’ll get to why later. Given Chan’s strengths as a filmmaker, it’s not surprising that American Dreams in China works well initially. Chan creates relatable characters through distinct character types, and he utilizes actors who flesh out those types enjoyably. 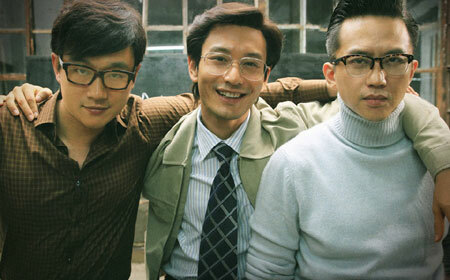 Cheng Dongxing (Huang Xiaoming), Meng Xiaojun (Deng Chao) and Wang Yang (Tong Dawei) are three friends who start an English language school in China, only to be accused years later by the United States’ Educational Testing System (ETS) of illegally using ETS questions on their study material. The film opens with numerous time jumps, first depicting the three as poor youngsters in 1980s China who are enchanted with the United States. By the end of the 1990s, the three have become rich men and are facing a six-figure lawsuit in the same America that once defined their hopes and dreams. Along the way, the three also had a falling out. Irony abounds, obviously. After setting up its origins (in university) and its climax (at the ETS hearing), American Dreams tells its story in largely chronological fashion. The journey is engaging and frequently funny; initially, the three characters are different but complementary types. The pedantic, pretentious Meng proudly boasts of his future success, while the bohemian Wang uses pop culture-infused English to romance visiting exchange student Lucy (Claire Quirk). Cheng is the dopey country hick whose thick skin and dedication help him win the affections of Su Mei (supermodel Du Juan), the hottest girl in school. Meng heads to America to seek his fortune while Cheng and Wang stay behind and eventually found the New Dream English-language school, which becomes popular largely thanks to Cheng’s self-deprecating teaching style. When Meng returns to China, he joins up with his old friends and New Dream reaches new heights. But with growth comes change, plus the loss and hopeful reaffirmation of idealism and friendship. Or something. American Dreams in China has a lot to say within its rags-to-riches storyline. On one hand, it’s an exploration of China’s changing views of the West, and how the allure of Western culture has slowly lost its luster. At the same time, the film traces the growth of Chinese cultural power, and acknowledges China’s growing international clout. There’s also something in the film about how idealism evolves, and how a person who initially wants to change the world may end up letting the world change him. Ambition versus idealism, dreams versus reality – these themes are name checked, but it’s questionable if anything substantial is done with them. However, the ebb and flow of the men’s friendship, plus occasional shout outs to popular culture and historical events (a storytelling similarity between American Dreams and Comrades, Almost a Love Story), keeps the film moving entertainingly. As a film about friendship and nostalgia, American Dreams in China consistently engages. Credit Peter Chan, whose ability to handle character drama isn’t limited to scripted exposition. Chan utilizes plenty of monologues and voiceover, but there are also moments where characters show themselves through action. Cheng’s pursuit of Su Mei is enjoyable, and is helped greatly by Huang Xiaoming’s self-effacing performance. The actor plays against his handsome looks well, and Du Juan makes a suitably unattainable object of desire. Du is a cold performer overall, but that’s acceptable as she doesn’t carry the film. Deng Chao and Tong Dawei fare much better; Deng nails his character’s intelligence and ego, and Tong is incredibly likable as the most amiable of the three friends. Character focus is uneven (e.g., Meng’s wife, introduced early on, is forgotten for most of the film), but storytelling is largely fine, with Chan employing montage, voiceover and smart pauses that allow the actors opportunities to shine. As a commercial film, American Dreams in China is solidly made and superficially quite good. But there’s a cliff and American Dreams goes careening off it. Towards the end, the film attempts to gather all its themes – friendship, dreams, America vs. China, etc. – for one rah-rah climax, but the resolution is so easy and unbelievable that it alienates. One character gives a speech trumpeting the brilliant economic and cultural growth of China while also knocking the West for its outdated thinking. There’s truth in those sentiments but what’s distressing is not the opinions, but that the film sells them with a speech from one person to a roomful of people who shouldn’t care. Also, the film offers dubious ethics as part of its “we win” reasoning, with one person claiming the moral high ground because he admits to breaking the law years after the fact. Plus he’s rich so he’s obviously doing something right. A mea culpa combined with a condescending “ha ha, I still beat you” taunt is not cause for a victory lap. The ultimate message of this triumphant speech is unconvincing and even immature. Notes:  The New Dream English language school is based on the story of the New Oriental Education & Technology Group, China’s second-largest private education company. Like New Dream, New Oriental was sued by the ETS for allegedly using ETS testing materials in their curriculum without authorization. New Oriental has denied any connection to American Dreams in China. New Oriental’s About Us page. New Oriental’s entry on Wikipedia.  Reportedly, director Peter Chan told Deng Chao that his character Meng Xiaojun, who goes to America to make his fortune and is disappointed by the experience, most resembles Chan himself. Notably, Chan left Asia for Hollywood in the late 1990s to direct the Dreamworks SKG film The Love Letter, only to return to Asia in the early 21st century. Also, like Meng Xiaojun, Peter Chan’s father and grandfather were both sent overseas for schooling in the United States.